Since my last post – way back in November – Bootstrap has been a whirlwind for this frenzied ops manager. We have distributed 1,000+ shares (6000+ pounds!) of compost to subscribers, welcomed a new van, Miley, to the fleet, battled the winter elements, and survived a flurry of staffing changes, including a driver quitting mid-shift on a Friday. TGIF will never be the same, sigh. Fortunately, we also brought in four terrific staff members in the past month alone, giving me ample time to churn out some blog posts! This particular post has been years in the making. In fact, my long-winded response to a company email about the topic probably landed me The BiG Stink blog series. In my early days at Bootstrap, as a young grasshopper cleaning buckets and sifting through scraps, I came across a lot of plastic. Plastic forks, plastic cups, plastic plates. More plastic than absent-minded passersby could toss in a compost container. Somebody, I finally realized, was adding this stuff on purpose. But why? Bioplastics: not all are created equal! Bioplastics, on the other hand, have a more complex definition. For a substance to be deemed a bioplastic, it must be biobased OR biodegradable OR be a high achiever and be both. Biobased refers to materials derived from renewable sources such as plant starch, vegetable fat, or even insect shells. Biodegradable is a catch-all term for the breakdown of materials by microorganisms whether it be in the water, in the sun, or in the soil. There’s no time limit on biodegradation; it can take 2 or 2,000 days for something to break down and still be called biodegradable. Biobased or partially biobased plastics that do NOT biodegrade. Biobased plastics that are biodegradable. Plastics that are petrochemical based and are biodegradable. 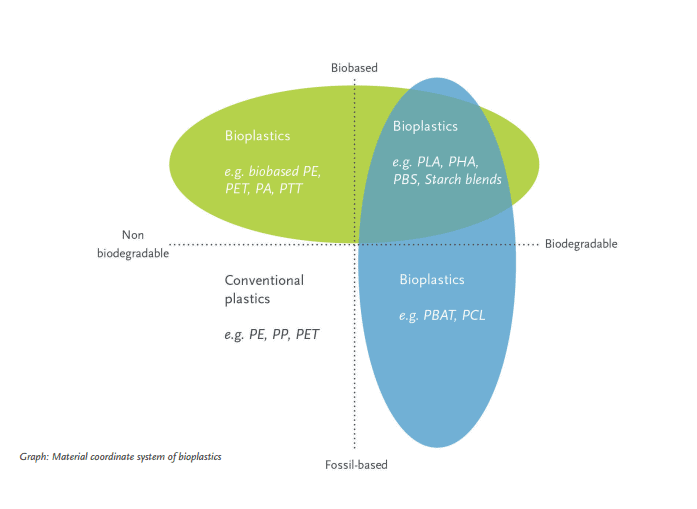 Yes, petro-based plastics can be called bioplastics, too. Hit the brakes. Recap: biobased refers to the beginning of a product’s life while biodegradable refers to the end of its life. Materials can be biobased or biodegradable or both and be termed bioplastic. Back to young Faith, elbows deep in slimy plastic at the Boot warehouse, squinting at labels. Biobased. Made with corn starch. Omni-degradable. And of course, industrially compostable. But wait, if there are plastics outright specified as compostable, what’s up with all the others? Are they compostable or not? If we’re getting technical, no, most bioplastics are not compostable. Composting is a category of biodegradation and refers to the specific conditions such as oxygen, heat, and the amount of moisture needed to break down a substance. According to the American Society for Testing and Materials (ASTM), in an industrial facility compostable plastics should break down at nearly the same rate as leaves and food waste. They should fully disintegrate and should be indistinguishable from finished compost. Lastly, compostable plastics should not produce any harmful toxins that impede plant growth during the composting process. What did we learn? Biobased does not mean biodegradable does not mean compostable. Each of these terms has a unique definition and they are not interchangeable. So how do you know if a plastic is compostable and safe for the Bootstrap bucket? A surefire way to tell is to find a Biodegradable Products Institute (BPI) logo. In their own words, BPI standards are “based on science, not hype” and conform to ASTM definitions of compostable. Compostable materials also may be labelled “ASTM D6400” or “ASTM D6868.” These two standards ensure plastic bags and packaging are safe for industrial composting. Another sure bet is anything labelled with the recycling symbol #7 AND says PLA (polylactic acid). Strong emphasis on #7 AND PLA. The #7 is the catch-all digit for any recyclable that doesn’t fit into categories 1-6 and is known as “other & miscellaneous.” One more time: #7 + PLA = compostable. What about products labelled “made with plant starch”? Are they compostable? More often than not, the answer is no. What about items labelled biodegradable? Maybe. Keep in mind biodegradable has no official timeline to decompose and has no requirement to be nontoxic after decomposition. A concerned consumer will be looking for the BPI compostable logo or the #7 PLA. These labels are always, definitely, and surely compostable in industrial facilities. Law 1: biobased does not equal biodegradable does not equal compostable. Law 2: always trust BPI compostable labels and the #7 PLA symbol. 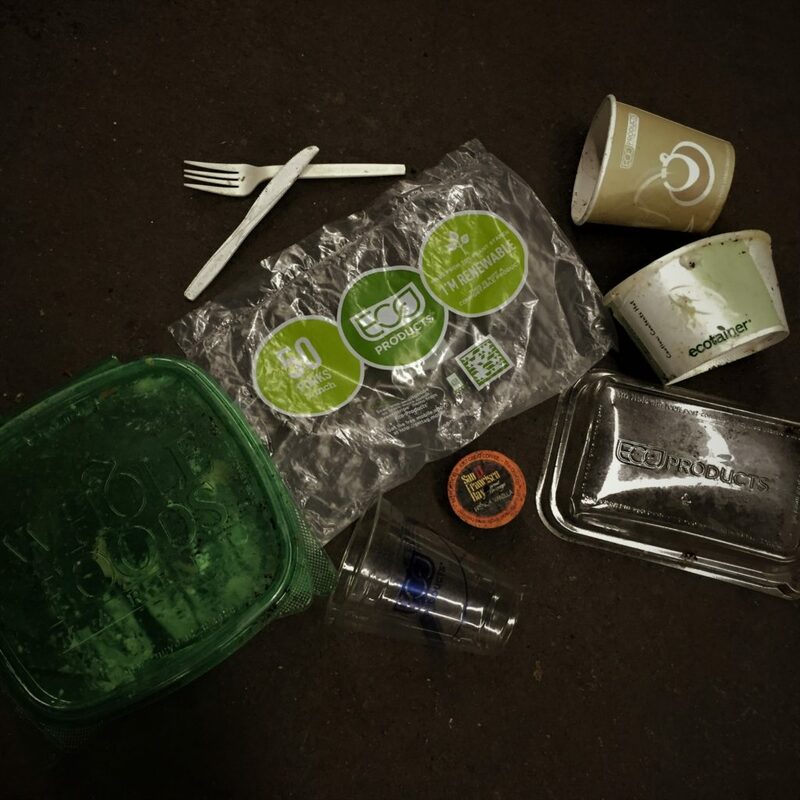 Law 3: biodegradable is for underperforming plastics that don’t meet compostable standards. To recap, bioplastics can be biobased, biodegradable or both. This means not all bioplastics are compostable and keep in mind biodegradable does not mean compostable. Compostable has strict requirements for how a material degrades, how long it takes, and if it’s toxic after decomposition. Biodegradable has no such restrictions. Finally, if you want to compost a plastic, be sure it has the BPI logo or the #7 PLA label. So there you have it. Years of bioplastic knowledge pared down to a mere 900 words and 3 laws. Go forth and be well-educated composters.